This weekend is the flower moon, it was named as such because this time of year in most of the world flowers should be out or people are planting flowers. The grass around the apartment just started turning green this week, so we have a while before we see flowers outdoors, but that doesn't mean that I can't see them indoors. 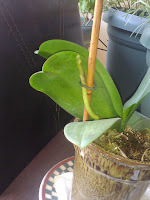 I also this week found that my orchid, that I swore was never going to produce flowers again, has started growing a new shoot. It's a tiny shoot but it's growing again after what seems like forever. Now this years flower moon is the closest to earth out off all the full moons this year and until sometime in 2014. How exciting is that! The moon will look really big and full so I suggest everyone, even if you're like me and do not have plans, to just look at it and appreciate the moon this weekend. I was just browsing through several blogs, looking for some inspiration for mine and came across your lovely place. First of all, never give up on an orchid. It took mine 3 years go get new shoots but ever since it's been blooming non stop for years. I've moved a few times myself in my short lifetime, and while yes for a while I lose my connections with nature I have found it is easier to gain it back if you work hard for it. Study the new local plants and use them instead of the local plants you are use to, spend more time outside. Eventually it'll start coming back. I never give up on plants, I'm just happy and impatient hehe. I absolutely love orchids... sadly I do not have a green thumb... leafy plants that need little attention are about the best I can do. Thank you for linking up to Pagan Pages Blog Hop!